Researchers for Israel say dem don discover di longest salt cave for di world. Di sabi pipo say di desert site dey near wia, according to di Bible, Lot wife turn to pillar of salt. Dem map out di 10km (6.2 miles) long passage and chambers of salt inside Malham Cave wey dey overlook di Dead Sea for research since over two years ago. According to di researchers, more rain fit increase di length of di Malham cave wit time. For 1980s dem bin also map part of di Malham cave wey run through Mount Sodom wey be Israel longest mountain. 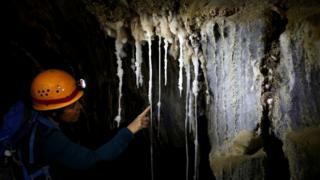 Dis new discovery don beat di 13-year record since 2006 wey di Cave of di Three Nudes wey be 6.85km (four miles) salt cave for Iran Qeshm Island been hold.